If you are a property manager in need of commercial paving services in Northern Virginia, you probably have a lot of questions. You know that well-maintained parking lots and roadways all contribute to a property’s positive image and curb appeal. Conversely, parking lots and roadways gutted with potholes, alligator cracking and puddles severely detract from the image you want your property to convey to potential customers, clients or tenants. Because the exterior of a property, including the paved areas, are the first things they’ll see, people may make snap judgements about your property. Let Espina Paving, Inc. help you create a great first impression from the moment anyone first drives on to the property you manage. 1. How long as this commercial paving company been in business? The longer a commercial paving company has been providing services, the more references and local work you will be able to check into. Ask previous customers how well the commercial paving company adhered to their needs, stayed within budget and provided quality work for their commercial paving project. Espina Paving, Inc. has been boosting the curb appeal and increasing commercial property values for property managers and owners across Virginia, Maryland and the D.C. area since 1976. 2. Does this commercial paving company specialize in bigger, commercial paving jobs? Another important aspect of experience property managers need to look at is how much experience an asphalt contractor has in doing large commercial jobs for retail, homeowners associations, schools, churches and other large organizations. A residential contractor can say that their company has done large jobs like this, but you will need to look at their history closely to ensure you’re hiring a real commercial paving contractor with experience doing exactly the sorts of jobs you need done. Espina Paving exclusively provides commercial paving services (no residential jobs) for homeowners associations, retail outlets, restaurants, hospitals, schools, industries, airports, and entire towns. We have cultivated the experience, equipment and asphalt mixes necessary to handle large-scale, heavy-duty traffic jobs across the area. 3. How well does your commercial paving contractor communicate with you? Again, it will be necessary for you to ask references about how well your paving company representatives keep in touch with you as a job begins, progresses and comes to a close. Make sure they have a record of clearly communicating the exact nature of any job you need done, and that they completely understand your needs as a property manager. Frequent, clear communication is essential to the success of any commercial paving project. 4. How much experience does your commercial paving contractor have in doing your particular job? Experience is essential for large-scale, commercial and industrial paving jobs. Make sure to delve into references and check previous jobs for any commercial paving company you consider hiring to improve the curb appeal of your property. 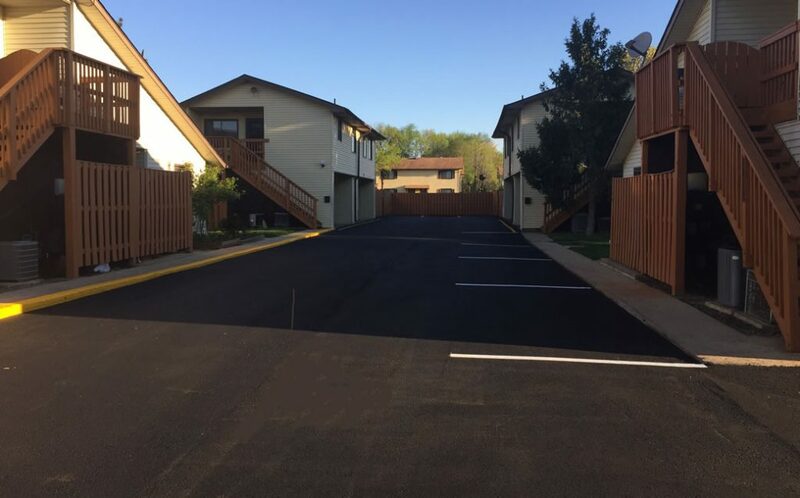 Espina Paving, Inc. has done literally thousands of varying asphalt installations, repairs and renovations for large scale property management companies over the past four decades. 5. Is your commercial paving contractor flexible to meet your needs? As a property manager, if you are renovating or repairing large paged areas while customers and tenants still go about their daily business on your property, you will want to ask your commercial paving contractor how they decrease the impact on these people while the job gets done. This may include paving at off hours or overnight, or skill with creating alternative routes. Espina has 40 years of experience with all of these techniques to help reduce the stress for everyone. 6. Does your commercial paving company provide high-quality service? Ask references about how clean the worksite was kept, how quickly the project was completed, how well they stayed within the budget, the quality of the work done and how well they minimized disruptions to your property during their job. Espina Paving, Inc. has been the D.C. area’s go-to commercial paving company since America’s bicentennial 4 decades ago. We work very closely and intently with property managers and are very experienced in handling a variety of large-scale jobs they require with fast, friendly service, high quality work and attention to detail. Request a free estimate for commercial paving services today, or just call us at (703) 491-9100 for more information.